As commercial real estate owners, we constantly strive to maintain the look and integrity of our properties. Dumpster enclosures are the most overlooked area of a commercial property site and the most likely to be damaged by the inevitable carelessness of others. Whenever we developed a new property, little attention was placed on protecting the walls of dumpster enclosures as well as the control of the placement of the dumpster container on the site. We have used the standard practice of installing bollards within the enclosures, but not surprisingly, the enclosure walls were still being damaged. Needless and costly repairs sparked an idea as simple as the hula hoop. If we could control the removal and the replacement of the dumpster, our problem would be solved. 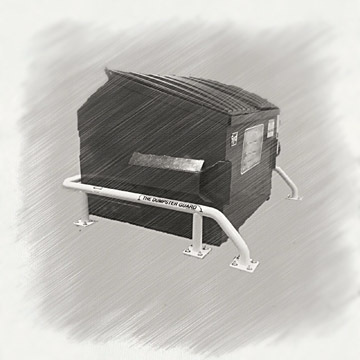 Engineered and patented, THE DUMPSTER GUARD®has been installed and tested at many of our franchise locations such as Starbucks, Ihop, Dunkin Donuts, Party City and Kimco Realty. These locations were chosen because of their excessive turnover of containers and the wear associated on their dumpster enclosures.